"Repent" -- A scene from the Washington National Mall. Photo by takomabibelot. Used by permission under a Creative Commons Attribution License 2.0. 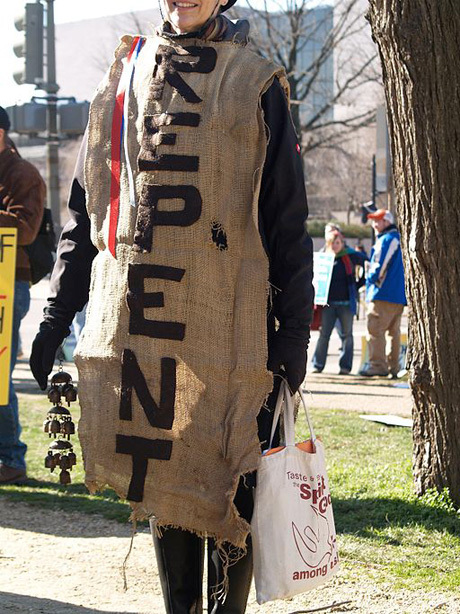 Note that the sackcloth banner calling people to repent is accompanied by a smile! See the texts (NRSV), artwork and Revised Common Lectionary Prayers for this service at the Vanderbilt Divinity Library. After a lame beggar is cured by the power of the Risen Lord through Peter and John, Peter invites the wondering crowd to repent and follow Jesus. Five thousand of them do! Thanks to God for vindication and rebuke/teaching to those who criticize or disgrace. The sung response is a line from the familiar song, "There is a balm in Gilead." For singing the psalm, consider Tone 5 in D minor. We are God's children now as we abide in Jesus. Abiding in Jesus enables us to live more and more without sin. Repentance is no one-time act, but a lifelong commitment to abide in Jesus. That is why we continue to purify ourselves that we may be like him when he appears. After his appearance to two dispirited disciples heading toward Emmaus, Jesus tells the rest of those gathered at another meal to proclaim repentance and forgiveness of sins in his name. For Leccionario Comn Revisado: Consulta Sobre Textos Comunes (in pdf), click here. The Third Sunday of Easter continues our celebration of the Risen Lord. On this Sunday last year, we heard the story of the Emmaus Road and experienced walking and talking with Jesus and recognizing him in the breaking of the bread. In Year B (this year), we hear the continuation of that story. We experience the awe of seeing the Risen Lord and his call to be witnesses of his resurrection to extend the call of repentance and forgiveness made possible through him. In Year C, we go fishing with Peter and experience breakfast with the risen Christ on the beach. All three years involve encounters at Table. Although this is a "fourth Sunday" rather than a "first Sunday," strongly consider the possibility of offering Holy Communion today. Remember that Easter for us is not a single day, but a season. So as you plan, think of these weeks as a continuous series, each building on the previous, all leading to a crescendo of celebration at Pentecost. During these weeks, we reaffirm together what it means to serve a Risen Lord in the power of the Spirit, and prepare the newly baptized to understand our theology and use the gifts of the Spirit in ministry in the world. See "Worship Planning for Eastertide, Year B" for a planning guide to use the Eastertide lectionary texts to plan worship that supports the missional purpose of this season. The General Conference of The United Methodist Church begins this week, April 24-May 4, in Tampa, Florida. We hope you will encourage your congregation to join in daily prayer for and with their delegates and leaders. See 50 Days of Prayer for General Conference for resources available in multiple languages and by multiple means to help you join United Methodists around the world in daily prayer. Today (April 22) is also both Festival of God's Creation (Earth Sunday) and Native American Ministries Sunday (a Sunday with offering). Remember, it is also still Eastertide! So, as you plan worship, plan with Eastertide and its texts in mind first, and find ways to relate the programmatic and offering emphases to the Scriptures for the day. The links above take you to the primary support sites for these days in our denomination. You can find additional supports on the Discipleship Ministries website for Festival of God's Creation/Earth Day and Native American Ministries Sunday. This coming Friday at General Conference, evening worship will consist of an Act of Repentance to Native Americans and Indigenous Commmunities. 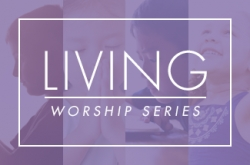 Consider how worship and other initiatives this Sunday and in the weeks to come may help connect your congregation to this Act of Repentance in ways that allow our collective ritual action to move into real change on the ground where you are. The suggested theme for worship today seems almost an oxymoron. We associate Resurrection with joy, and repentance with sorrow. We associate Resurrection with exuberance, and repentance with solemnity. We associate Resurrection with life, and repentance with death, or at least with life gone wrong. Yet in the stories of the resurrection of Jesus and his presence as Risen Lord in the early church, repentance is a constant theme and is constantly connected precisely with Resurrection! Like the face of the woman decked in sackcloth proclaiming "Repent" in the image above, these stories declare repentance with a broad smile! Repentance with a smile? Yes! Christ is risen! Death is conquered. Christ is risen! Sin no longer has dominion over us. Christ is risen! We can truly be changed by the power of the Risen Lord dwelling in and among us. Christ is risen! We can repentfor the joy of it! Repentance remains solemn work, to be sure. To undergo a change of mind and a redirection of our actions requires us to face the reality of our sinfulness, the harms we have caused, the harms in which we continue to participate, and the evil we may not yet have fully renounced. To repent almost always requires us to discover and uncover to others things we may not wish to admit about ourselves. Repentance requires vulnerability, that we lay ourselves open to experiencing wounds and truths about ourselves we may have tried to numb ourselves against. Repentance is thus never a one-time act, but always a journey we take day by day, one step at a time. That is part of why it seems daunting to us to undertake seriously. Repentance becomes our way of life if we do so. Yet it is the first word of the commission Jesus gives to his disciples in our reading today. "Repentance and forgiveness of sins is to be proclaimed to all the nations, beginning from Jerusalem" (Luke 24:47). How will you plan worship today in ways that invite people to the hard work of repentance with a smile? How will you help people begin to grasp that the resurrection of Jesus means repentance is indeed good news, both for their own lives individually and for the life of the world? The common theme across this week's texts is repentance as a response to the resurrection of Jesus. Throughout his ministry, and throughout Lent in the church year, we repeatedly hear the call of Jesus to repent in response to his teaching that God's kingdom has drawn near. Often, that call can feel like condemnation, and the move toward repentance can feel like it is motivated by fear. For some, perhaps those whose lives were most invested in resisting God's reign for their own benefit, it surely was. But for most of his first hearers -- the poor, the marginalized, the sick, the mentally ill, the oppressed -- repentance meant the embrace of the good news that God really was on their side of history and they needn't live any longer as if those who claimed to have ultimate power really did. In short, the call to repentance during Jesus' ministry was, for most, a call to revolutionary hope. The resurrection of Jesus made that revolutionary hope and its accompanying call to repent and receive God's forgiveness spread and multiply everywhere. The text from Luke this week, with its commission to declare repentance and forgiveness of sins, is the necessary background to the reading from Acts. If your congregation prefers to hear the readings in a more or less linear way, consider reading these "out of order" this week. Consider letting the reading from Luke come first today, and then the readings from Acts and I John. In Acts, the kingdom-sign of the healing of a man born lame created the opportunity for a public call to repent, receive forgiveness, and follow Jesus. Note how Peter's proclamation proceeds. It starts with the fact of this man's healing and their astonishment. It names Jesus as the power by which this happened. It names their complicity in the execution of Jesus, but then immediately does two other things. It declares the resurrection of Jesus and recognizes that their complicity in his execution was the result of ignorance, not malice. This invitation, even to persons complicit in the execution of Jesus, thus moved away from condemnation and offered revolutionary hope. It was an offer of genuine repentance -- of metanoia, a change in consciousness that could cure their basic ignorance and unleash healing even for those that might be thought to be utterly incurable. Where and how do folks in your worshiping community bear witness to the actions of God's reign overcoming what may have appeared to others to be beyond repair or change? When have folks where you are used such opportunities to declare the resurrection of Jesus, the presence of his reign, the offer of repentance and forgiveness, and the invitation to join them in following Jesus? Encourage your worship planning team to think outside the usual boxes as they ponder this question. We're not talking about worship services here, necessarily. The story in our reading from Acts happens outdoors in the course of daily living! Maybe such stories have happened for your folks at a hospital or a funeral home. Maybe it was through an automobile accident or an AA meeting. Maybe it was a surprising decision in a courtroom or a social worker's office. Maybe it was in a classroom, or via Twitter! Wherever and however they happened, connect these stories to this text in some way -- through art, storytelling, images, song, whatever it might be. Consider including examples from such stories among your prayers of thanksgiving today. And consider giving thanks both for what was recorded in Luke and Acts and what has happened in your midst as part of your thanksgiving at the Lord's Table today. I John explores the same theme in a different way for a different audience. While the story in Acts describes disciples in ministry literally outside in the world, the words in I John are directed to disciples gathering exclusively as disciples and addressing especially their "personal" lives. "Remember what you are," John says, "children of God destined to look like Jesus in his final appearing." That's the reason we can continue to live repentant lives. That's why we "keep cleansing ourselves." (The verb here is mostly associated with cleansing by water -- an allusion to baptism and so to God's gracethan other "ascetic" forms of self-purification). Continuing to cleanse ourselvesabiding and growing in sanctifying grace, as John Wesley might put it-- means we are living out of our identity as God's children. It also means we will attain "that holiness without which no one shall see the Lord" (Hebrews 12: 14, often quoted by Wesley). There is a kind of spirituality out there that says something like "If I just listen to my inner self, my true self, and follow through on that naturally, I will be fulfilling God's will. I don't need rules and laws and guidance for practices." I John does not support this view. Instead, John immediately says, "Everyone doing sin is practicing lawlessness. And sin is lawlessness" (verse 4). Our call to continue cleansing ourselves is a call to practices attentive to the law and way of Jesus who came "to eliminate sins" (plural, referring again to practices, not "nature"). Sin was not part of his own nature ("sin is not in him," verse 5). "All abiding in him," staying close to him, "are not sinning." Why? Not simply by spiritual proximity. They are cleansing themselves (verse 3), and it is those practicing righteousness that are righteous (verse 7). The logic is not reversible. It is not that if we are righteous (by nature) we won't be able to do sin. We are not righteous by nature. Only God is. It's that if we are doing righteousness, we will become righteous and participate in Christ's elimination of sin from the world and sin's power over our lives. In I John, the words are simple. The Greek is perhaps the easiest to translate in the entire New Testament. But the task of interpretation, as we have seen, can be intense. How will you and your worship planning team help your worshiping community both hear and understand this teaching about repentance in response to the Resurrection today? You might start by asking folks on your worship planning team what their practices of righteousness are, and how they've seen people deeply practiced in such ways growing more like Jesus, able to see him as he is. See where that conversation leads in your group, what stories are told, what images are evoked, what songs may be brought to mind. You might think about where in the normal flow of worship you are, or in the flow you design for today, these examples may fit. Might it be in preparation for confession, pardon and peace before Communion? Or perhaps as a response to the sermon, giving testimony to how, indeed, a life of repentance (continually cleansing ourselves) draws us closer to Christ and frees us from sin? If you are offering baptism or receiving new members today, might there be tie-ins there? Or might this be an emphasis that you need to let folks take home with them, or take up in a small group or in a Facebook group during the week? Experience and storytelling. One way to connect the experience of the Third Sunday of Easter to Native American Awareness Sunday is through the practice of storytelling one or more of the readings, or offering the sermon more as story than as exposition. For examples and guidance for telling the gospel lesson today, see Thomas Boomershine's GoTell website. Baptism and the newly baptized. Not only are the Sundays of Easter appropriate days for baptism, but they are also wonderful days for preaching to the baptized, both to the newly baptized and to those who have been living in the baptismal covenant for a long time. You may want to consult William Willimon's Peculiar Speech: Preaching to the Baptized or The Intrusive Word: Preaching to the Unbaptized for help with this approach to preaching. If there were baptisms (or professions of faith or confirmations) on Easter Sunday or last Sunday, be sure to continue to affirm, pray for, and attend to these people. Integrate them into the life of the congregation especially your worship life! We have ample witness from the early church that the newly baptized all served at the altar (with the clergy!) during the daily Eucharist for the entire week after their baptisms. (Yes, daily Communion!) Continue to work with them to discern their spiritual gifts and how they sense God calling them in daily-life ministry. See pages 107-108, 120, 143 in Come to the Waters. Begin planning now for a "Service of Affirmation of Ministry" on the Day of Pentecost. Living resources. As you plan, think about the people in your church and community and consider how you can invite them to participate in worship. For example, are there Native Americans who can lead in prayer or offer music that enriches your celebration? Are there ecumenical representatives who could bring greetings or lead in prayers for the unity of the church? Are there people who need to hear that God is out to forgive them? Who from your congregation is making sure this good news gets out? See Book of Worship 425 for additional suggestions for Native American Sunday. 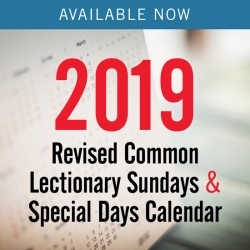 (Note: Festival of God's Creation was added to the United Methodist Program calendar after the publication of The United Methodist Book of Worship in 1992. That is why that volume does not contain a set of resources specified for that use). Online texts are available at the Vanderbilt Divinity Library. Jesus was one of them. He was sent by the God of their ancestors, Abraham, Isaac, and Jacob. Jesus was no stranger to them. He was the one who was rejected and handed over to Pilate to be killed. Jesus' history did not end in the grave; he has been raised from death. Faith in Jesus' name has restored this beggar's health. Do not let guilt keep you from approaching God; what was done to Christ was done in ignorance. Repent and turn to God, who will wipe away your sins. Visit www.lectionary.org for Richard Donovan's weekly exegesis of the New Testament lections in English, Spanish and Chinese. Estudios Exegtico: Homilticos -- Spanish-language Revised Common Lectionary resources from Instituto Universitario ISEDET in Buenos Aires, Argentina. The Painted Prayerbook -- Offering a unique combination of her original artwork and writing, Jan Richardson's blog includes reflections on the lectionary readings. This is the next logical stop on our post-Easter journey. On Easter Sunday, we learned that the tomb is empty. Last week, the disciples, including Thomas, came to realize that Jesus is alive. This week's post-Resurrection appearance takes place after Jesus encountered the disciples on the Road to Emmaus (verses 13-35). The two Emmaus disciples ran to Jerusalem to inform the Eleven that Jesus was alive. While they were in conversation about Jesus' appearance to the disciples in Emmaus, Jesus himself appeared to all of them and spoke. Peace be with you (verse 36b). These are echoes of words he had spoken to the disciples days before in John 14 and 16. Why are you frightened (verse 38), and why do you doubt? These words echo those spoken to Joseph in Matthew 1, to both Mary and Zacharias in Luke 1, and to the shepherds in Luke 2. Luke's report supports the bodily resurrection of Christ. His hands and feet bore evidence of having been crucified. He could be touched; he was not a ghost or an apparition. Finally, the passage concludes with Luke's version of the Great Commission --repentance and forgiveness of sins is to be preached to all nations -- which actually extends into verse 49. For additional accounts of this Great Commission, see Acts 1:6-8, or Matthew 28:16-20. Visit www.lectionary.org for Richard Donovan's weekly exegesis of the New Testament lections in English, Spanish, and Chinese. What better way to enliven your preaching than to begin by storytelling the text! The site offers several online workshops in storytelling and has a section organized by lectionary year with both audio examples and commentary on the lectionary texts. See this week's texts at www.gotell.org/pages/stories/Luke/Lk24_36b-48.html. "Why do you stare at us as though by our own power or piety we had made him walk?" What does the postmodern, post-Christendom church believe about healing and miracles? The Eleven believed after they saw and touched Christ. What is the basis of the faith of the multitude of today's Christians? The Emmaus believers ran to share their testimony of an encounter with the Risen Lord. What does this passage suggest about the nature and importance of testimony? Old Time Religion? When Peter preached to the Jews in the courtyard, he used reverence for a shared past as a basis for trusting God more fully in Christ. Peter started with Christ's Jewish heritage. Jesus was a servant of the God of Abraham, Isaac, Jacob and their ancestors. The Jews in the courtyard had more in common than they realized with these strange believers who had just healed a lame beggar. Peter modeled a common strategy for missions and evangelism. He started with what would have been common ground before stretching his audience on the importance of the Christ event. Peter's sermon, delivered to the Jews present near the Temple, anchored Christ in their own history. As more and more people stumble into churches without faith memories, what common ground will you use in your sermons to help newcomers connect with the Christian faith? Not so long ago, effective preaching could build upon the faith stories of the local community. Today, however, Dr. George Hunter reminds us that Americans may now have as many as three generations of people in one family who have no Christian memories! It may be hard to imagine a child, her mother, and her grandmother with no experience with the church, but this is becoming increasingly true! Where is the common ground for today's sermons? You might start with analyzing what today's people are concerned about, what they aspire to, and how they identify themselves in current affairs and history. Compare their fears, hopes, and self-location with that of biblical people during Jesus' time as you imagine how you might preach Jesus to the people in your courtyard. The Name that Heals. What a powerful statement. Faith in the name of Jesus has made this man strong! The reports of events beyond the natural found in Acts are often unsettling to the ultra-rational twenty-first century mind. Don't be afraid to just report the story, without an attempt to rationalize. The gospel is meant to be unsettling and thought provoking. See From Emmaus to Jerusalem. Not in spirit only. What will you say to your congregation about the Resurrection of Jesus Christ? There have been a number of church controversies, past and present, over the nature of Christ's body both before and after the Resurrection. Several online resources are provided on this subject, including what The United Methodist Articles of Religion say about the Resurrection of Christ and John Wesley's notes on the passage. What are you afraid of? We live in a time of great fear and anxiety, as did the early disciples. Violence and hate have rented a permanent spot on the evening news. The economy is still in a fragile state of recovery. World events are unpredictable, and countries once considered our allies now have new, unfamiliar rulers. The world as we know it has been turned upside down. The disciples' world was also turned upside down. Their leader had been crucified, and those who followed him closely went from celebrity to suspect. What would their future hold? Chaos or celebration? Jesus appeared among them and spoke words of peace to those fears and doubts. How does Jesus appear among us today, and what is God saying to us about doubt and fear -- even in the midst of national, international, and economic crises? "Repossessing Virtue: Parker Palmer on "Economic Crisis, Morality and Meaning" from the American Public Media series: "Speaking of Faith"
Official United Methodist beliefs about the Resurrection of Jesus Christ can be found in the Book of Discipline under the Articles of Religion.